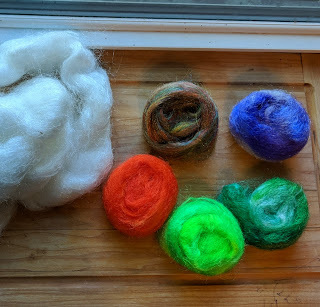 Okie dokie, recently I've been playing with my new to me drum carder and watching a ton of videos on blending/adding goodies to your fibers in order to add interest, color and texture to your fiber work. 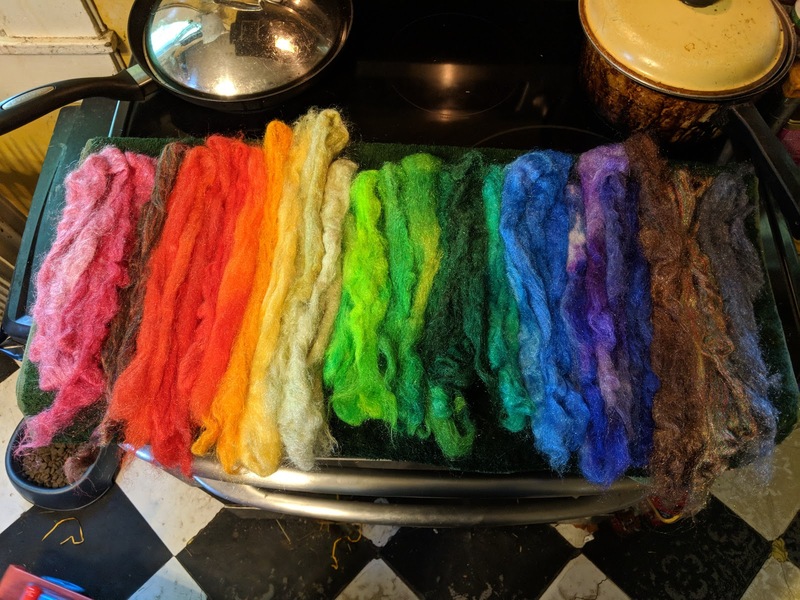 I have wool, mohair, alpaca and angora but didn't have any as of yet. Well, that changed recently. 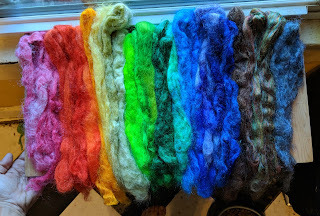 A local business sadly closed its doors but while I was there I was able to pick up a bunch of Firestar. 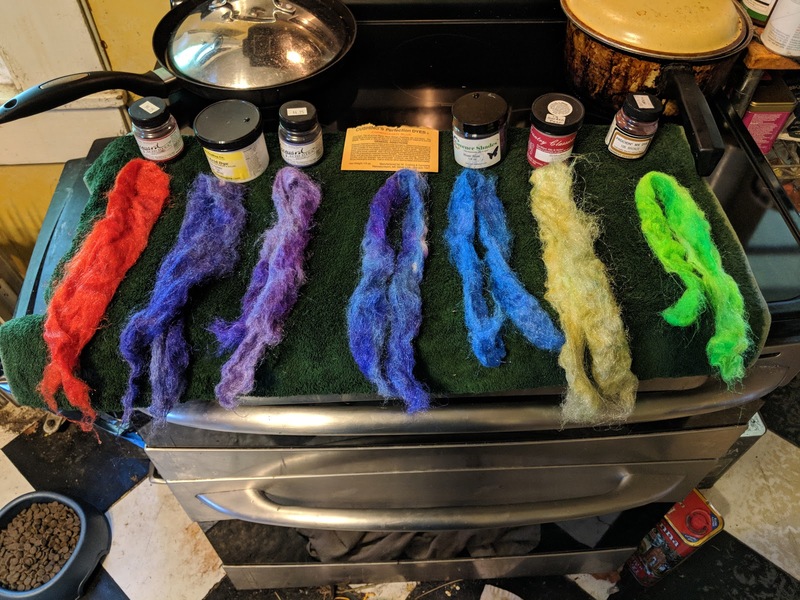 (I did look up whether or not it was dye-able before making my purchase) I got a nice assortment of colors but wanted more variety and more solid tones. 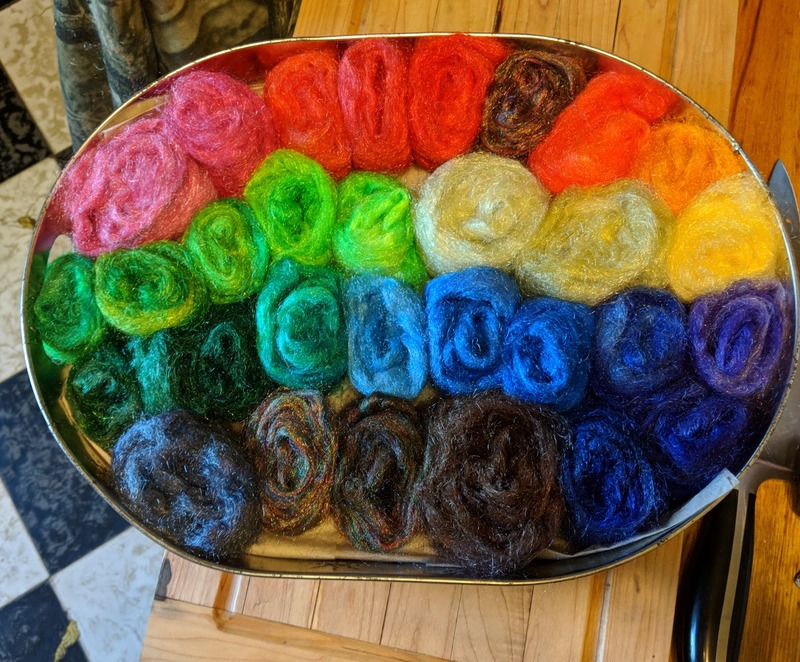 There will be a full list of dyes used at the end of this post. Unfortunately I forgot to take a picture at the start of this. So, here's one of the un-dyed fibers (except purple) most of the way through the process. I skimmed through Blue Barn Fibers blog post on her method and realized; I could dye an entire rainbow in a couple hours! I did mine over 4-5 batches, all while taking pictures and trying to keep careful track of what I dyed and with what kind/color dye. 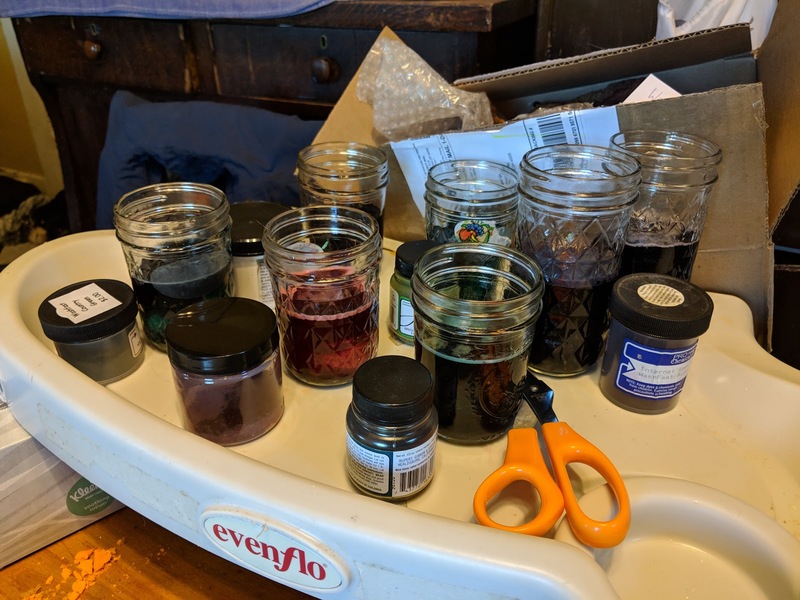 I was limited by the number of jelly jars I had clean and on hand. Even so it only took a couple hours Wed. morning. 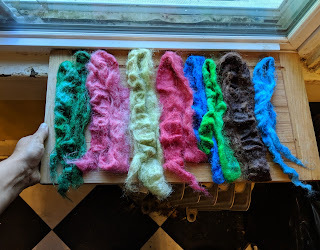 I did separate all of the firestar into 1/4 ox portions and rolled them into little nests the night before. 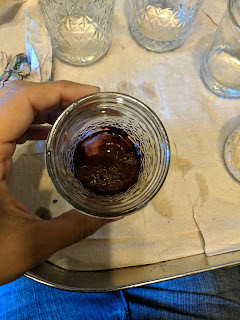 I scooped the dye (super scientific, I totally did not measure) into the bottom of my jars and added hot tap water over that. 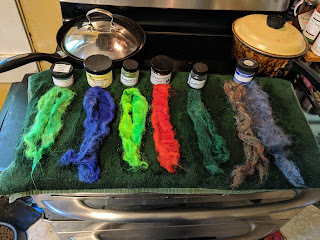 Mixing them thoroughly before adding my nests of fiber. For the last round, I did add a splash of vinegar to each jar. It deepened the color just a bit and I achieved a more even tone, however I don't believe it was 100% necessary. There was almost no change in the shade of the reds. 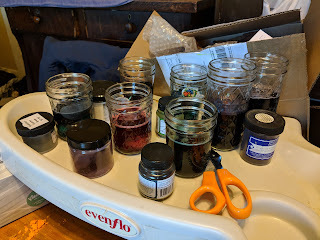 I carefully sat each jar next to its colorway just so I would know which firestar was dyed with which color. I let them "process" for between 5-10 minutes and then moved to the sink for rinsing out. 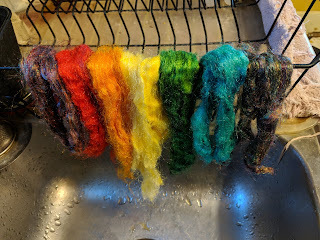 Rinse out and let each batch drain for a bit while setting up the next round. I took lots of pictures during and tried to document as best I could while still trying to get as much dyed as possible. 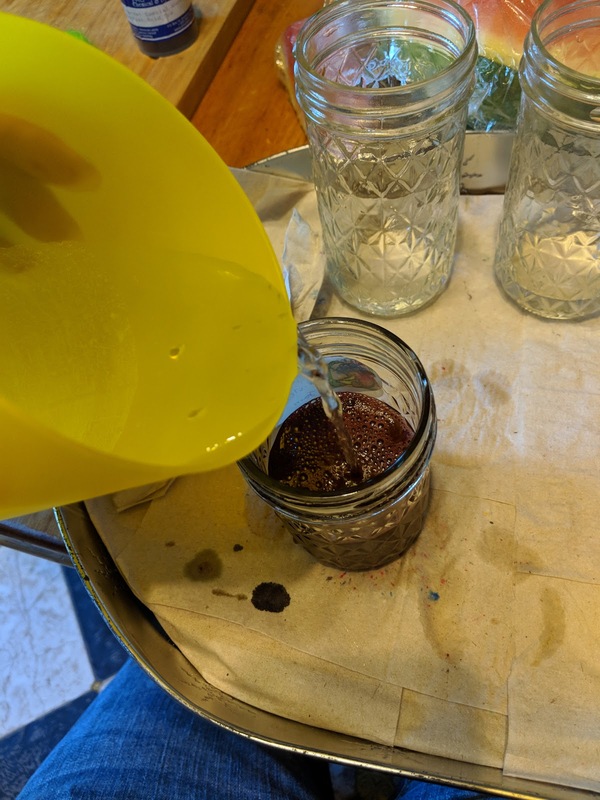 I also sped up the drying process by rolling one batch at a time in a dry (dark colored) towel and stepping on it to further squeeze out as much water as possible. I think this is round 4? Done! 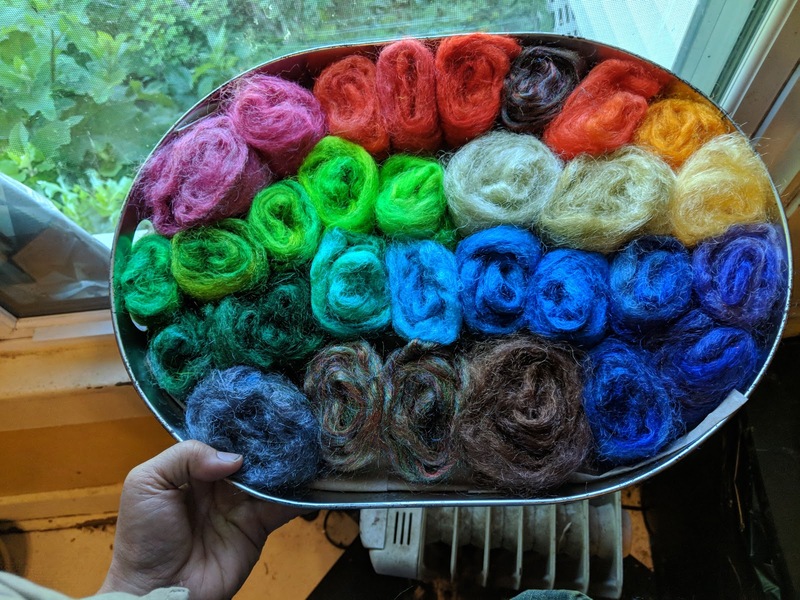 As you can see the reds are not supper deep. Also the rainbow Firestar would not take much dye at all. Kind of like they were just tinted. Overall I really like how everything came out and would definitely do this again! I do have several oz of white firestar left we'll see what the future brings!